With oclif you can get up and running with your command line interface quickly, and focus on the implementation of the commands themselves. We believe CLIs should be designed primarily for human readability and usability, while at the same time supporting advanced users and output formats. For example, input and output should be consistent across commands to allow the user to easily learn how to interact with new commands. oclif follows the usability principles in our CLI Style Guide, which provides direction on designing a delightful CLI experience. Creating a Single CLI (with just one command) can be done in less than 3 minutes! The requirements are Node, npm and yarn. Try our getting started tutorial to get up and running right away. 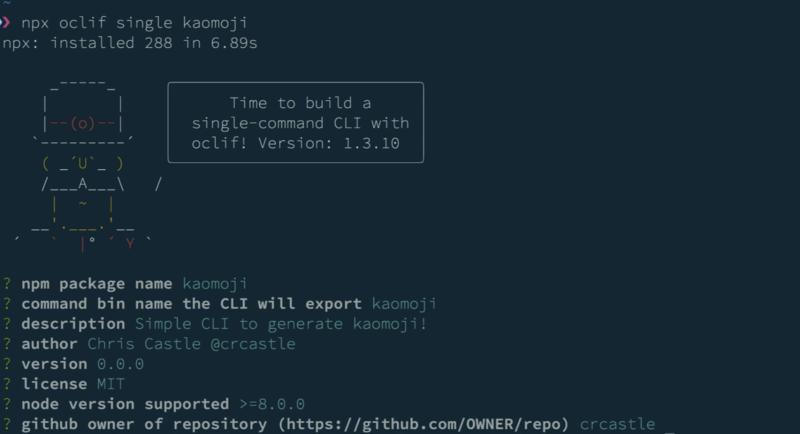 The Heroku and Salesforce CLI projects are large and complex, so we built a small example CLI from the ground up to test out oclif and give you an idea of what is possible with oclif on a smaller scale. Hello kaomoji! Generate scaffold - run npx oclif single <your cli name, e.g. kaomoji>, 'single' here denotes a single-command CLI. Read more about what that means in the oclif docs. You can learn more about oclif on its dedicated community site, which includes detailed documentation, example projects, and links to sample code. We also discuss the development of oclif in more depth in the Salesforce engineering blog. We'd love to hear your feedback as you develop on oclif and welcome your contributions. We even have a few Github issues that would be great for first-time contributors. We'd also love to include more examples of CLI's built with oclif on our site. Please drop us a line at ecosystem-feedback@heroku.com or join the conversation in Gitter.